***NEW RELEASE*** 1300 Moons is based on the life story of Saulteux Ojibwa Chief Kioscance or Young Gull who lived during the French régime in North America ca 1640-1748. It follows his life’s journey from a youth through his years as a warrior, to great War Chief, to elder on the council. Young Gull led his people south after the Iroquois War to establish them at Aamjiwnaang at the foot of Lake Huron. 1300 Moons – David D Plain : Trafford Book Store. 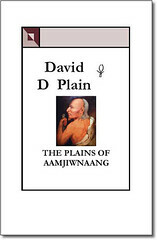 You are currently browsing the Books by David D Plain Blog blog archives for October, 2011.